So yes, I know I have been a bit MIA (missing in action) the last couple of days but was just caught up with work and home related chores; but back with a quick and easy recipe. The recipe I am posting today is from a Pakistani cookbook - Manpasand Live@9 with Chef Gulzar. I am not a big fan of watching cooking shows that come on food channels mostly because I don't have the time to wait an hour to note down a recipe. However, some chefs have really good recipes and keep coming up with new ideas to keep the viewers interested; also these shows are a a great concept for teaching basics and complicated dishes in a step by step manner and also encouraging people to try out new things. Ketchup/Chilli Garlic/White Sauce - 3-4 tbsp; while the recipe was pretty good, however, I just felt it needed a little bit more sauce so I would suggest adding either of the sauces mentioned depending on taste to enhance the flavor. 1. Mix eggs and breadcrumbs in a bowl; set aside. 2. Cube chicken; heat oil in a pot. 3. Add garlic & garlic paste and chicken and cook till chicken changes color. Add salt and black pepper. 4. Add corn, capsicum, red chillis, black pepper and salt. Mix. 5. 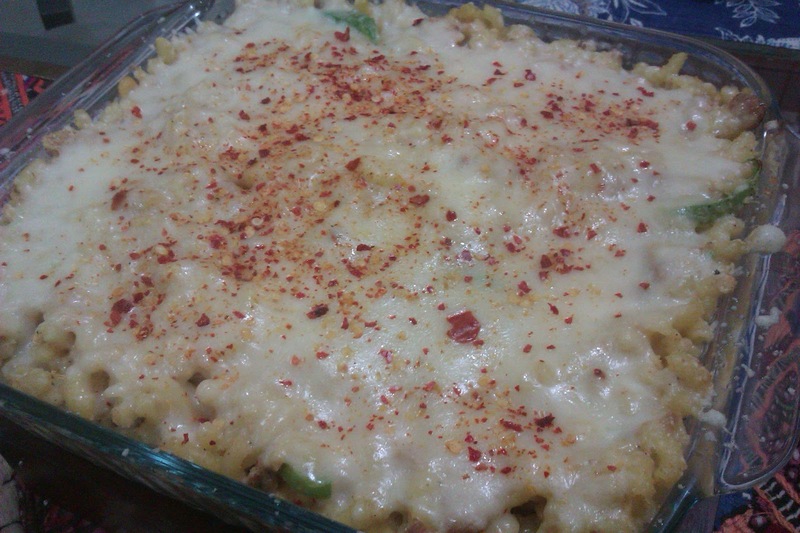 Add egg and breadcrumb mixture; then add macaroni and mix together; add ketchup/chilli garlic or white sauce; cook for a few minutes; remove from flame. 7. Bake in a pre-heated oven at 200 C for 10 minutes till cheese is melted.